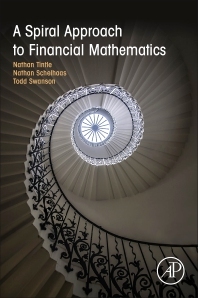 A Spiral Approach to Financial Mathematics lays a foundation of intuitive analysis of financial concepts early in the course, followed by a more detailed and nuanced treatment in later chapters. It introduces major financial concepts through real situations, integrates active learning, student focused explorations and examples with Excel spreadsheets and straightforward financial calculations. It is organized so sections can be read independently or through in-class guided-discovery activities and/or interactive lectures. Focusing on conceptual understanding to maximize comprehension and retention, using modern financial analysis tools and utilizing active learning, the book offers a modern approach that eliminates tedious and time-consuming calculations initially without underestimating the ability of readers. Nathan Tintle has authored other textbooks in statistics, as well as having published a wide variety of journal publications in biostatistics, genetic epidemiology, psychology, and statistics education. He initiated new programs at Actuarial Science at two institutions and has been teaching financial mathematics for over 12 years. Among other honors, he was the 2013 winner of the Waller Statistics Education Award and the 2017 winner of the Robert Hogg award for Excellence in Teaching Introductory Statistics. His first book, with co-author Todd Swanson, “Introduction to Statistical Investigations,” won the award for the 2017 Most Promising New Textbook of year from the Textbook and Academic Authors Association. Nate Schelhaas is a Fellow of the Society of Actuaries and Member of the American Academy of Actuaries who works for Principal Financial Group in Des Moines, IA. In his 20+ year career, Nate has held various positions with Principal. He currently serves as the chief actuary for the individual life operations. From 2009 – 2011 Nate oversaw the actuarial training program at Principal where he was responsible for helping actuarial students navigate the exam system and their careers. Todd Swanson is a member of the mathematics department at Hope College in Holland, Michigan, where he's been teaching since 1989. He predominantly teaches introductory courses in mathematics and statistics, and has coauthored six textbooks. Prof. Swanson has presented at numerous national meetings, workshops and mini-courses on innovative ways to teach mathematics and statistics that focus on guided-discovery methods and projects. He has received awards for teaching, writing, and mentoring students and his work has been funded by the National Science Foundation, the Great Lakes College Association, the Howard Hughes Medical Institute, the Teagle Foundation, and Hope College.